Dr. David Sherer is preparing to retire, and he couldn’t be happier. Leaving behind his lengthy career in the medical sector will free him up to focus on his love of writing. David, 57, recently finished writing an autobiographical tale about his quest to reunite with the maid from his childhood home. It’s his second book, following a patients’ hospital “survival” guide that he wrote. And he’s eager to carry on composing with the written word. “There is a third book I’m thinking about. It’s brewing somewhere in me. I’d like to write some fiction,” he said during a laid-back dinner interview in Washington, DC. 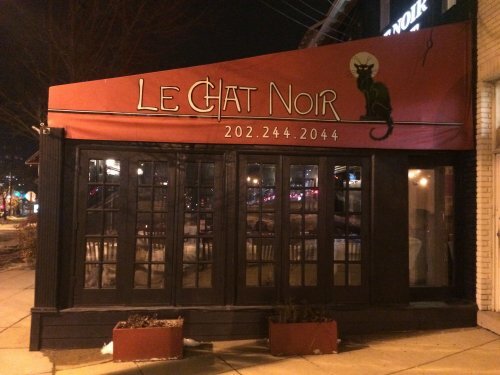 We met at the French restaurant Le Chat Noir, two of less than a dozen diners that night. Perhaps the cold weather outside had something to do with the low turnout, but it can’t have been anything to do with the aesthetics of the place. 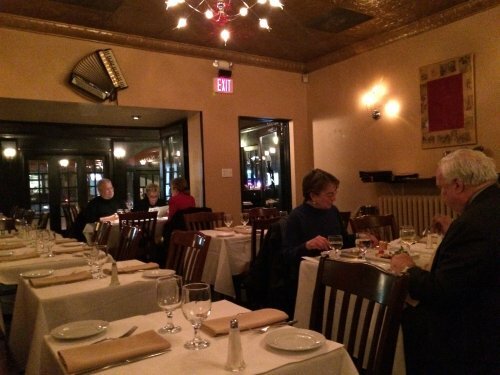 It’s a warmly lit restaurant with a few minimal pieces of decorative art inside (including an accordion hanging on one wall). 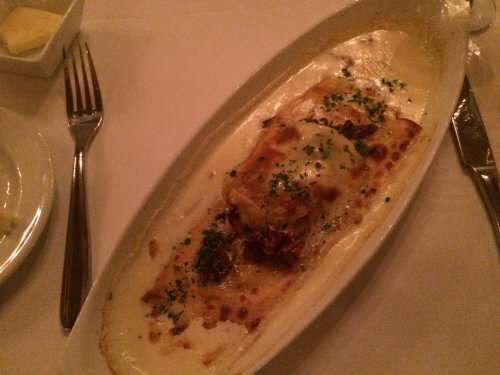 The menu features a host of traditional French dishes – including an almost-overwhelming variety of crepes. It was my first time at the venue, so while I perused the menu, David told me more about his plans to continue on his nascent second-life as an author. He’s still toying with ideas for the third book, but in the meantime has entered a short story writing contest for Bethesda Magazine. Winning, or even placing, in that contest “would sure be a shot in the arm” that would encourage him to write the third book, David said. With a busy career as an experienced anesthesiologist, David has had to fit his existing writing around his work schedule – something he is preparing to leave behind. And he spoke with apparent relief about being able to put the long hours and other strains of his career behind him. Sipping on a glass of sparkling wine, David said that he’s looking forward to spending more time with his family (he’s married with one son) and pursuing his interests such as writing. “I’m not old, and I would like to do a lot more that’s outside medicine,” he said. 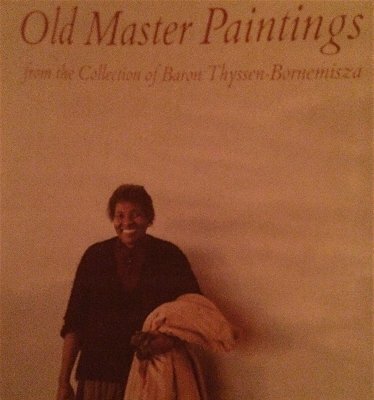 “I had to give up all of my artistic ambitions to become a professional and earn money. Now that I’ve earned money, I’d like to explore something else,” he added, flashing his often-present, warm smile. 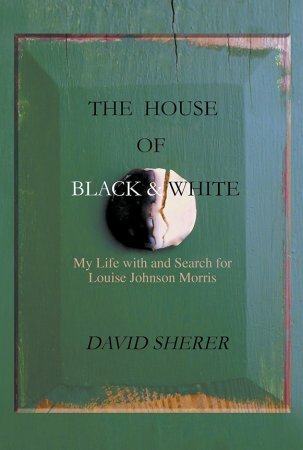 Acting on one’s goals and not procrastinating is an ethos David used in writing his second book, which chronicles his idea to try and reconnect with the African American maid Louise Johnson Morris. “There was a tremendous amount of strife in our family growing up. My own mother and father did not get along well and were always at loggerheads with each other. It was a chaotic, frenetic environment. Louise had a pacifying affect, she was something peaceful to cling to,” David said. The maid lived with the Sherer family for roughly 22 years, but in 1981, a short while after David left for college, Louise was let go — and he never really knew the reason why. Contact had been broken with the woman who had meant so much to him in his early years. The silence bothered him for decades, until about five years ago he finally decided to try and reunite with her. “People talk about closure, tying up whatever loose ends might be out there. I felt this would be a great creative way to tie up loose ends by writing about it,” he said. The closure he needed was in part because he never found out what happened to Louise after 1981. But where to start? “I didn’t even know whether she was alive or not,” David said, as he leaned down to pick up a bag he’d brought with him. 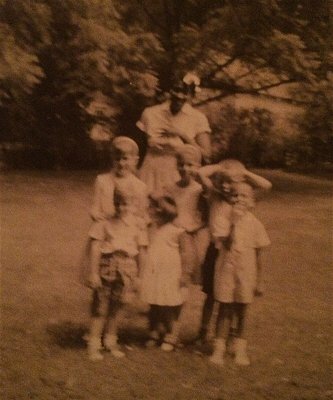 He pulled out a sepia-toned picture of six happy children, with a stylish-looking, smiling woman towering behind them. “This was Louise when she worked with our family, and that’s her with me and some neighborhood children,” said David. As David reached for a second photograph, his smile grew. The adoration he still feels for Louise was obvious when he looked at a second picture of Louise, taking around 1972 outside the National Gallery of Art in Washington, DC, when she was about 50 years old. That mean Louise present-day would have been in her 90s. David tried to think where to start in tracking her down. “I figured that the only way I would find her is through her son’s footprint,” he said. He knew the name of Louise’s son, and so he started by using the internet to try and track him down. Eventually he found an address in Baltimore and went to visit it. He knocked at the door but there was no answer. So he left a note explaining who he was and why he wanted to contact Louise. All he could do after that was wait and see whether he’d ever hear back. He did. Louise’s son called to say that his mother was still alive and now living back in her home town of Macon, Georgia. Buoyed by this discovery, David quickly booked a flight down to Atlanta and within about a week was down South, spending several days with Louise, talking and reminiscing. “It was an unbelievable reunion,” he said. “To see someone you hadn’t seen in over 30 years, who was like your mother, it was almost indescribable,” he added, smiling fondly. The reunion was tinged with some sadness as Louise’s formerly towering figure was now confined to a wheelchair. And a short time later, Louise passed away (her funeral ends the book). But before that happened, the two were still able to share memories, and David said he made connections with Louise’s family members that he’s still maintaining today. After writing about his childhood memories and his experiences reuniting with Louise, David launched a joint venture with a publisher to try and sell the book. He also hired a public relations firm to help get word out, as well as doing his own promotional work. “What you learn as an aspiring author is that if you don’t do the legwork, nobody’s going to sell your book for you. I’ve done a lot of aggressive campaigning for myself,” said David. 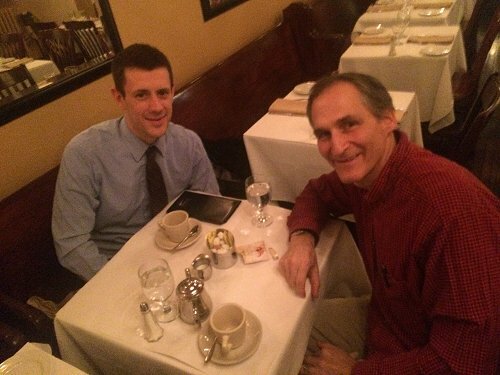 David’s promotional work includes dining with a stranger. 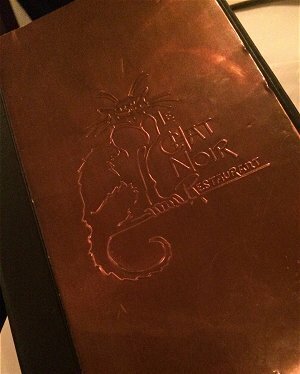 He suggested Le Chat Noir, saying it’s a place he likes to dine at once in a while. I wouldn’t expect harsh words from David, who comes across as self-effacing and friendly. And based off the starters, I could see why he had kind words to say about the restaurant. When the waiter set down my appetizer of a crèpe savoyarde, I thought I’d made a huge mistake. The dish — a crepe stuffed with caramelized onions, St. Nectaire cheese, and prosciutto — was massive, making me worried it’d kill my appetite for the entree. Even so, I couldn’t resist eating the whole thing. The crepe was incredibly rich without being sickly, and was a great starter. 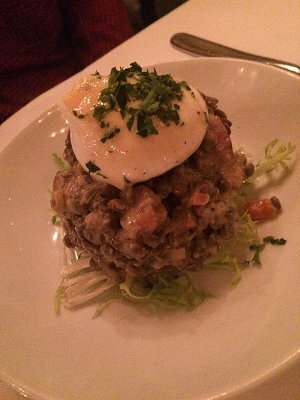 David played it healthier with his first course of the salade paysanne, featuring green lentils, bacon, frisée salad, a poached egg, and Dijon mustard vinaigrette. While we ate, he told me that writing The House of Black and White had been an entirely different experience from his first book, the Hospital Survival Guide: 100+ Ways to Make Your Hospital Stay Safe and Comfortable. It’s a how-to for people checking in at a hospital, everything from tips on how to best zip through the waiting room to what to expect pre- and post-operations. Example: the book talks about what David says is the “July syndrome” at hospitals. Apparently that month is the worst to have surgery done at a teaching hospital because that’s when all the new residents and interns start. “It’s the most dangerous time to be in a hospital,” he said. What prompted him to want to compile his hospital knowledge in one book? “One reason was that I kept getting asked the same questions by patients, and thought there should a resource for people to go to,” he said. The other reason is that his sister was chronically ill from age 7 until she died age 26, and she had some bad experiences at hospitals — things David didn’t want others to go through. “This book answers every question you might have when you to go a hospital,” he said. “I think it’s as pertinent today as when it was written in 2003, nothing much has changed except some of the technologies,” said David. The book has won good online reviews and some accolades, including being named by the Wall Street Journal as a top-five best book on healthcare in 2005, but David said that sales have been modest. Still, he’s proud of the book whenever he hears from hospital patients who have used the book’s information to make their stays more pleasant. While the waiter took away our now-demolished starters, I told David about my own trip to the hospital in 2009 to have my appendix removed. That experience included a painful visit from an intern who pressed down on bandages covering a fresh wound (yes, it hurt, and yes, I swore out loud) to waiting almost two hours at check-in even though the appendix could have burst at any time. David has thought about writing another book about the need for the human race to step back from gluttony and sloth and take better care of itself. But he dropped that plan for fear that it would come across as “too preachy” and that nobody would pay attention to it. Nevertheless, he does have many thoughts on the current state of healthcare, which he thinks has evolved in a bad direction since he wrote his guide. He’d love to see everyone have health insurance but believes existing efforts have either been botched or, like Obamacare, had horrible rollouts. And he’s concerned about major health corporations swallowing up smaller practices, turning patient services into businesses and branding rather than focusing on care. “I think that the trend will continue at least in the next few years, and I think you’ll most certainly see a move where medicine is strictly for business and not the more human science that my father practiced for 57 years of his life from 1950 to 2007,” said David. His father’s career in medicine is what drove David into the same profession. And so while studying for his BA he also completed his pre-medical course requirements. He said his father touted his long career as a doctor to lean on David to enter the same profession. But David didn’t like the idea of being tied to the same office day in, day out. That’s why he chose to specialize in anesthesiology. “I could go to work anywhere and carry my skill with me, unlike my father who needed an office. I guess I was looking for an exit strategy even before I started,” he said. 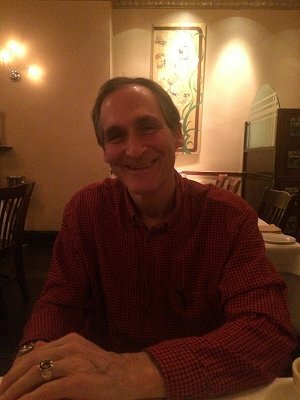 He got his MD at Boston University in 1984, then did an internship in internal medicine at the Sinai Hospital of Baltimore in 1985. Then came a residency at the University of Miami Jackson Memorial Hospital in the late 1980s, at the height of the city’s drug wars. David shook his head slowly as he recounted the scenes in the inner city hospitals, seeing patients pour in with machete and gunshot wounds far too regularly. It’s not hard to see why David didn’t decide to settle in Miami and instead returned to Maryland. That’s where he’s been practicing anesthesiology ever since. For me that conjures up images of the guy in the operating room who puts the mask on a patient and knocks them out. As David explained, the truth is a lot more detailed than the “Hollywood version” of his career. It’s not just anesthetizing people to knock them out cold for surgery — it can also include localized numbing of just parts of the body. And it’s a complicated process that requires David to assess a slew of factors including how the individual patient might react to a particular anesthesia medication. “It’s easy to put someone to sleep. The trick is to wake them up,” he said. If anyone were out cold, the size of the dishes at Le Chat Noir would wake them right up. The restaurant provides incredibly generous portions of food. 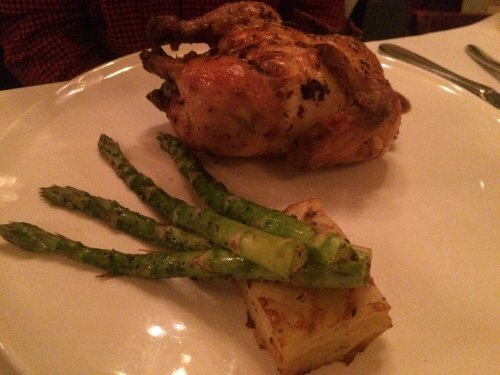 David opted for the Cornish hen stuffed with portobello and chestnuts, serveed with a yukon gold potatoe pavé, charred asparagus, and a foie gras-Madeira jus. He had nothing but praise for the dish, and I admit to some jealousy with what looked like a great meal. To fight off the cold weather outside, I chose the beef bourguignon. 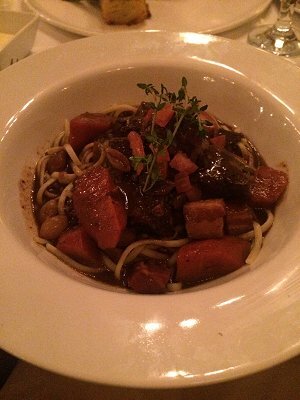 It’s a traditional French beef stew with pearl onions, bacon, carrots, and mushrooms, covered in a Burgundy red wine sauce, and served atop linguini pasta. I found the pasta to be an odd addition that didn’t really work, and the dish had a somewhat smoky tint to it that wasn’t the most pleasant. It wasn’t a terrible dish, but it was far outshone by my crepe starter. Still, the entree was enjoyable enough to plow through while David and I continued to talk. And the hefty portions meant that neither of us were in the mood for dessert. Instead, we ordered drinks to finish our meal — tea for him, coffee for me. While we sipped on our hot beverages, David also told me about another interest he’d had while toiling away in the medical industry. He’s the holder of two patents. The first was for an invention that would lead doctors through a series of algorithms that medical professionals are supposed to follow when responding to a critical cardiac event like a heart attack. The second was for a coin clip for doctors back in the day when their buzzers would go off and they’d have to make payphone calls to reach the hospital. Neither brought David millions, but he got joy out of the inventing. Not that financial matters are what drives him. Instead, he keeps his eye on his looming retirement and the expectation that he can finally fully indulge in his true passions. The freedom David will get from retiring will allow him to write his own future.